Floating heavy loads on a cushion of air makes them easier and safer to move. Air caster technology, introduced in the early 1960s, is evolving to support aerospace manufacturing and aircraft maintenance, providing precise movements of heavy loads with minimal manpower, enhancing employee safety and productivity. Air caster technology floats heavy loads on a virtually frictionless film of air. An air bearing inflates with compressed air, and as pressure increases, the load is lifted similar to a puck on an air-hockey table. The result is significant load distribution and lift, making it possible to move thousands of pounds without damage to the floor. Air casters reduce friction 10:1, resulting in a load that is up to 10x easier to move. The inherent suspension provided by air casters is particularly important for aircraft manufacturing since moving sensitive pieces of tooling, equipment, or parts to a new work station leaves little room for error. The systems reduce excessive vibration, also crucial for transporting very sensitive parts or tooling. Air casters offer complete freedom of movement in all directions, allowing operators to maneuver and align loads precisely within limited floor space. Most importantly, heavy loads are not restricted to a fixed path, and assembly flow is unrestricted. Entire aircraft, tooling stands, and individual components can benefit from air caster technology, including silhouette stands, elevators, and wing-installation tools. New or refurbished engines can be moved on air caster systems as can raw parts, fuselage sections, landing gear, and turbine components. Load movements require less shop floor space than traditional cranes – a crane or a heavy-duty forklift may need a 20ft x 20ft operational zone. Limited space can impede operational workflow and diminish productivity when moving tooling or large parts. With the caster system, an employee attaches a hose, pressurizes the air bearing system, and one or two people can move tons from one aisle to the next. Precise positioning allows placement of tooling systems to less than 1" of a fuselage. Every load movement is precarious because a minute defect caused by a seemingly innocuous bump can result in a prohibitive and unacceptable delay to the manufacturer. Every time employees move large, heavy aircraft parts or tooling systems across the shop floor, worker safety is paramount. The less contact employees have with a heavy load, the lower the risk of injury. Air caster industry statistics show a considerably higher rate of safety with its technology compared with wheeled dolly, forklift, or crane movements. Load movement with air bearings requires little training or maintenance, further reducing operational costs. Air bearing technology also reduces wear on facilities. Floating loads above the surface eliminates potential for floor damage and subsequent, costly repairs. Every smooth, flat, and nonporous floor is adequate for air bearings. In cases where a floor has gaps, channels, or access panels, a specially designed air bearing can move loads across gaps and steps in floors. Aerospace-specific tooling (engine support stands, elevators, mounting tools, etc.) can employ customized air caster systems completely embedded inside the tooling, eliminating the need for external components. Machine shop tools, lathes, CNC machines, and other heavy equipment can have embedded air caster technologies to enable controllable, safe movement – including those frequent instances when a shop floor must be reconfigured during manufacturing. Manufacturers that use cranes but are considering air bearing systems will find that process flow is likely to be altered, allowing greater process efficiency, safety, and lowered costs. “Air caster technology provides a better long-term, low-cost solution than disassembling and reassembling our structure,” states one aerospace user. 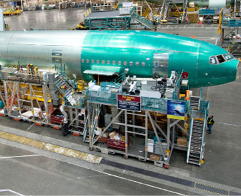 Aerospace manufacturing and aircraft maintenance sectors have realized significant cost savings and increased flexibility by adding air bearings to their production lines. Precisiely moving heavy loads has enabled efficient and safe manufacturing processes for more than 60 years. Air bearing technology continues to innovate and adapt – much like the aerospace industry it benefits.